Here is an essential point that everyone needs to know. The stock market is not the economy, it can move on politics, emotions, uncertainty, and even momentum. 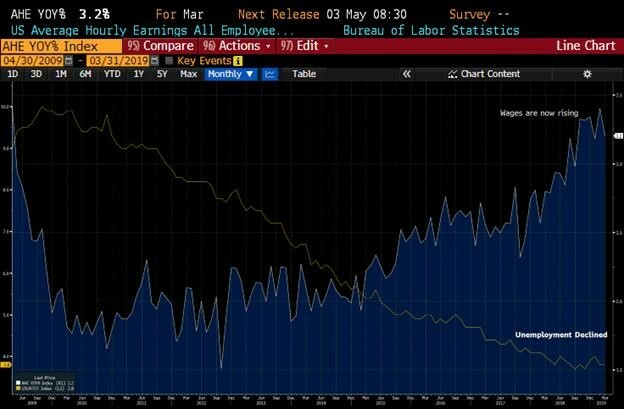 This chart shows the decline in unemployment and since we reached peak unemployment we are seeing wages finally start to rise on the other side. This is very positive. From September 2018 until now we had a really rough ride in markets, but during that time period, (see below) the US added on AVERAGE 193,000 jobs per month. This means we are adding jobs, at higher salaries, we are bidding people up and their market value increases as labour is in such short supply. I’m not an economist, but I cant understand how this could possibly be negative? That being said, we had a good March number. Lastly, the federal reserve is no longer hiking interest rates, but potentially planning to cut. Meaning they don’t want cool the economy, they want to stimulate it. They want to try to stimulate a 3.8% unemployment economy with wages rising because the President put pressure on them. I can’t say this will be a smooth ride in markets this year, and I cant say all our stocks will go up, but I can say that we are not facing significant economic problems that should cause these kinds of declines. When the market happens to have a tough time, until this economic backdrop changes, you should expect us to buy dips.